Marine litter is nowadays commonly observed in any part of the oceans around the globe. In 2005, the United Nations Environment Programme estimated that approximately 6.4 million tons of litter are disposed of in the oceans and marginal seas each year. About 8 million items are dumped on a daily basis, of which approx. 5 million are deliberately discarded overboard or lost from ships. It has been estimated that over 13,000 pieces of plastic litter are floating on every square kilometre of ocean surface (UNEP, 2005), but only a small fraction remains there: 70% accumulates on the seafloor and a further 15% is deposited along shorelines (Werner, 2010). The region studied in this project will encompass the coastline of Lower Saxony, using new monitoring and modelling strategies, but also the larger river systems Ems, Weser and Elbe as well as the open German Bight with its waterways, from the Channel to the northern North Sea. 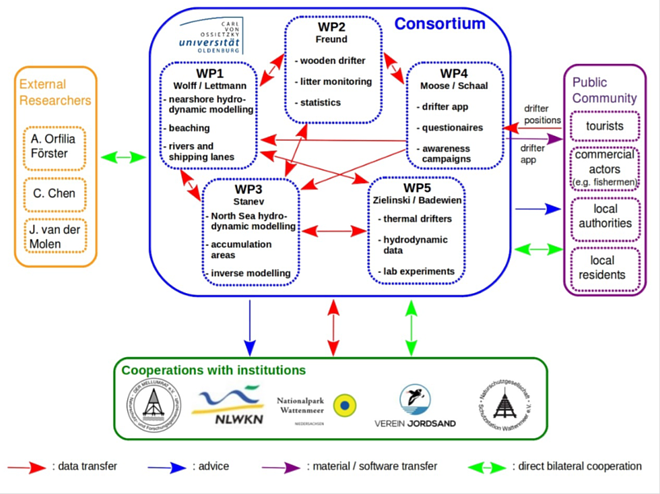 The study area has a comprehensive spatial range due to the special emphasis placed on the existing marine litter monitoring programs and data sets of regional NGOs (Mellumrat, Verein Jordsand and Schutzstation Wattenmeer) and the NLWKN (Niedersächsischer Landesbetrieb für Wasserwirtschaft, Küsten und Naturschutz), which cooperate with the project consortium.